Fortunately, there do exist solutions to the issues described in the previous section. Here we summarize some of the information available Globus Toolkit Firewall Requirements. First, we need to distinguish between two versions of the Globus Toolkit. Version 2 (GT2) has been around for several years and is used in a number of production Grids today. Version 3 (GT3) is based on industry standard Web services technologies and the Open Grid Services Infrastructure (OGSI) standards. GT4 was released in 2005 and is the latest version of the Globus software. While these versions are similar architecturally (both have GRAM, MDS, GridFTP), their network traffic characteristics differ. For the three basic services, GRAM, MDS, and GridFTP, Table 1 describes the network ports that these services use and need to be allowed into a site in order to give users access to those services. All ports are TCP ports. (1) Additional ports are dynamically assigned by the created user processes. (2) Application is sensitive to NAT translation. In addition to these services, the Job Manager and GridFTP request that a range of ports in the untrusted ephemeral range (port numbers greater than 1024) be open. If the firewall blocks ports in this range (many don't), then a range must be opened, and the environment variable GLOBUS_TCP_PORT_RANGE must be set so that all ports dynamically assigned by Globus Toolkit services fall into the opened range. The exact size of the opened range will depend on the exact usage of the system, but a good rule of thumb is ten ports per simultaneous user. Note that in GT3, the Job Manager uses the same port (default 8080) as the GRAM server, so the ephemeral port range is required only for the GridFTP service. A user behind a firewall can use GT. In order to permit this, the firewall needs to allow a port range for callback connections from the GRAM service. This range should be opened as described in the previous section and the GLOBUS_TCP_PORT_RANGE variable set in the user's environment. 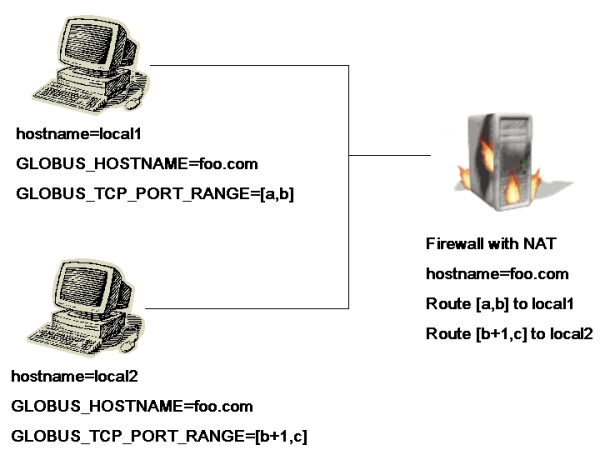 If the user is behind a firewall doing NAT, the user will also need to set the environment variable GLOBUS_HOSTNAME to the external address of the firewall and configure the firewall to pass incoming connections in the port range specified by GLOBUS_TCP_PORT_RANGE through to his computer. 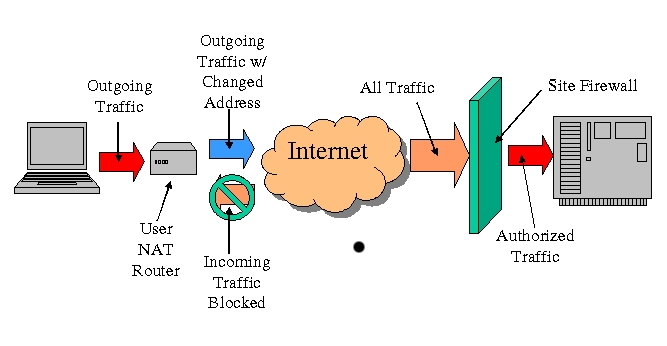 We hope that the leveraging of Web services protocols will enable firewalls that more intelligently allow traffic and relieve users of having to administer them manually. For example, with traffic being carried in self-describing, digitally signed XML messages, a router can easily parse and check the signature that authenticates the sender and open ports based on the result of such a validation. This work was supported in part by the Mathematical, Information, and Computational Sciences Division subprogram of the Office of Advanced Scientific Computing Research, Office of Science, U.S. Department of Energy, under Contract W-31-109-ENG-38 and under Contract DE-AC03-76SF0098 with the University of California; by the National Science Foundation; by the NASA Information Power Grid program; and by IBM. Information in this article was developed through the DOE Science Grid. Globus Toolkit is a registered trademark held by the University of Chicago. Von Welch is a security researcher at the National Center for Supercomputing Applications where he works on Grid Security and contributes to the Globus Toolkit security architecture. Olle Mulmo is an applications expert at the Swedish Royal Institute for Technology, where he works on Grid Security in national, Nordic, and European research and development projects and contributes to the Globus Toolkit architecture.